About the Book: Whatever happened after Sleeping Beauty woke up? Sleeping Beauty and her Prince married and had two daughters who live isolated, kept safe, and never allowed to touch anything sharp-although they don't know why. They discover the truth about their mother's past and learn that the eldest daughter, Aurora, has been cursed just like her mother. If Aurora pricks her finger, she will fall into a sleep and outlive everyone around her as she sleeps for 100 years. 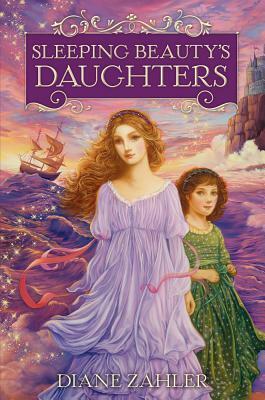 The sisters decide to take part in a quest to track down the fairy that could alter Aurora's curse before it's too late. GreenBeanTeenQueen Says: Fairy tales never go out of style-and my middle grade readers make this apparent on a regular basis. Fairy tales and fairy tale retellings are incredibly popular with the readers at my library and Diane Zahler is an author to put at the top of your list if you're looking for a great fairy tale based fantasy. Sleeping Beauty's Daughters, as with Ms. Zahler's previous novels, carry a very special magical quality. I love how this story takes a familiar tale and adds a new layer and depth to the story, giving us more backstory as to why Sleeping Beauty was cursed and how the curse could be changed. Aurora and her sister Luna are fantastic characters who you would love to go on a quest with. Aurora is your typical princess-she's well behaved, polite and good. I really liked Aurora and liked that even though she had those usual princess character traits, she never ended up being annoying. I related to her because she's the oldest and has a sense of responsibility that excites and scares her. But as much as I liked Aurora, I loved Luna. Luna is spunky and loves to try new things. She's outgoing and carefree and I would love to spend time with her and go on a grand adventure! They two characters balance each other well. They have a great sister relationship-they might get annoyed with each other and they might bicker, but they share a deep sisterly love and bond and would do anything for each other. This is a fantastic sister story at the core with a fairy tale wrapping. There's also a lot of adventure, magic, and suspense. The sisters meet a fisherman named Symon who helps the girls with their travels and the trio encounter many obstacles as they try to find the fairy who can alter Aurora's curse. There's also a bit of a cute romance that occurs. I love the writing and how various myths and tales come together to create this magical tale. It's a new version of Sleeping Beauty and readers who enjoy fairy tales or light fantasy novels are sure to enjoy it. The writing is lush and descriptive and perfect for middle grade readers who are wanting a book with some magic, but are not quite wanting high fantasy just yet. Fairy tale lovers will enjoy the familiar nods to the original Sleeping Beauty tale. A great read for readers looking for a novel with adventure, magic and a wonderful sisterly bond. Thank you for the lovely review, Sarah, and for hosting my book! I'm especially glad you found the sister relationship compelling; it's based a little on my own relationship with my sister (I'm the bothersome younger one, of course). This looks like a great book for my high level readers. Great review.